Discover the beautiful stories Michael Morpurgo, author of Warhorse and the nation's favourite storyteller. Billy was a champion soccer star, playing for Chelsea in the 1930s. 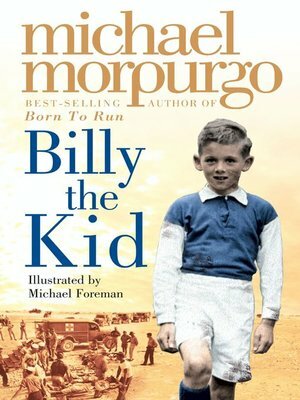 But that was before war broke out... Billy the Kid is told through the voice of an 80 year old man, who looks back on his life as Chelsea's champion striker until the outbreak of war in 1939 and on through his subsequent life. Billy joins Chelsea as a football apprentice, rises through the reserves to become a real champion. His passion for football sees him through the war years – even as a prisoner of war he organises a friendly against the Italians – but, having been injured by a mine he cannot play for Chelsea on his return to England. Billy turns to vagrancy and alcohol and for years he wanders up and down the country. He re-settles in London in a derelict house and is befriended by a family who move him to a shed in their garden. He, in turn, helps their son with his football who in his turn becomes a Chelsea player. Billy becomes a Chelsea Pensioner and his 80th birthday is celebrated when Chelsea play at home. A novel for both children and adults which deals with some difficult issues. Michael Morpurgo's storytelling is superb and this will be a welcome follow up to the previous Morpurgo/Foreman collaboration – Farm Boy.